I recently revisited and improved my image of Fair Rosamund in dried flower petals. I was very pleased with the result and thought I’d try two more quick dried flowers projects in the same vein – the first one took about a half an hour and the second one an hour. 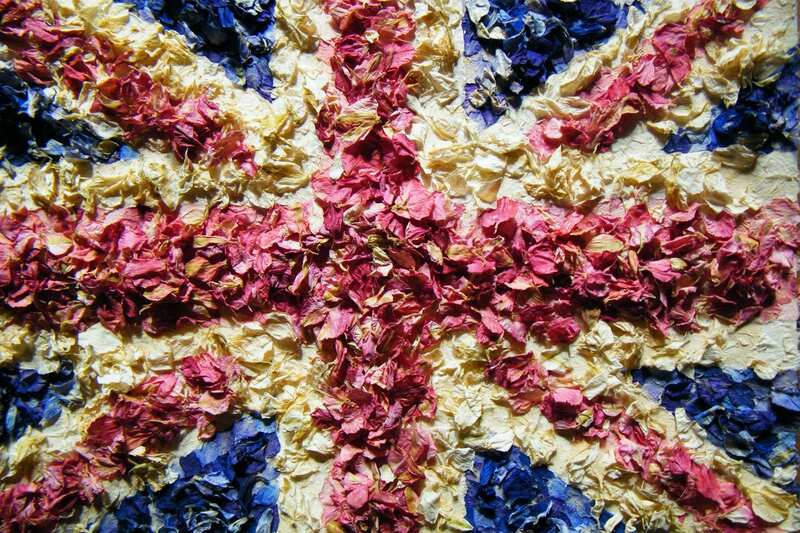 When I finished Fair Rosamund, I wished I’d treated the delphinium petals Union Jack I made last year in the same way. So I took some loose dried flower petals and sprinkled them over the image to produce a more 3D effect. Part of our daisyshop.co.uk logo is a wingding in green and white. I printed it out so it covered about 4 pages of A4 paper, then covered it in dried ivory delphinium petals and green hydrangea petals. Then I surrounded the logo with dark blue delphiniums. Of course these flowers are more commonly used as natural wedding confetti. Unfinished dried flowers logo before adding the blue surround. Finished dried flowers logo in delphinium petals and hydrangea. I’m still thinking about how I can use this image! The petals are really beautiful and as they weren’t glued down, they had to go back in the bag once I’d taken the picture, which seemed a great shame. Close-up of the dried flower petals with blue & white delphinium, and green hydrangea. Love the British flag! What an amazing job you did!